March 28, 2004 1:00 - 4:00 PM Regular meeting at the National Arboretum: George McLellan, "Travels East and West: Searching for Native Plants in Their Natural Habitats"
"Travels East and West: Searching for Native Plants in Their Natural Habitats"
We are very excited to welcome back George McLellan as the featured speaker at our next regular meeting which will be held at the U.S. National Arboretum on Sunday afternoon, March 28th. 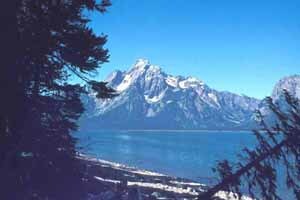 George will be giving us a wonderful slide program comparing the flora and mountainous scenery of two very picturesque regions: various ranges in the Rocky Mountains (pictured right) and our eastern Appalachians, such as Roan Mountain and the Smokies. Last summer, George spent several weeks in the wilds of the Northern Rockies photographing plant materials and those majestic peaks. He has prepared for us a beautiful visual comparison of that area with the native plants and mountains closer to home. As you may know, George is an expert photographer and a sought after speaker, so you won't want to miss his beautiful slides and engaging commentary at our next meeting. Those with last names ending in Q through Z, please bring a treat for the refreshment table. Business meeting at 1:30 p.m. Program at 2 p.m.
Van Veen Group Order: We expect the plants ordered last fall from Van Veen Nursery to arrive in time to distribute at the March meeting. We might have a few extras so bring money! Our Annual Flower Show will be held in conjunction with the Azalea Society National Convention held at the Comfort Inn, Bowie, MD. The hotel is located at US 50 and 310 at MD Route 3, about 15 minutes down Route 50 from the National Arboretum and 7 miles from the Beltway. Entries will be accepted on Thursday evening, May 6, from 4 to 7 p.m. and on Friday, May 7, from 6:30 to 8 a.m. and 4 to 6 p.m. Judging will be Friday evening and will be open to the public that evening as well as on Saturday. Details will be mailed later. 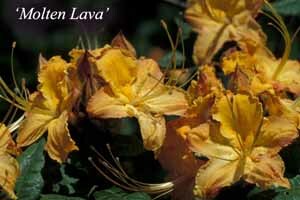 Rough winters such as this one can often lead to broken branches on your rhododendrons and azaleas. Don't throw them away because you can often root those cuttings while in a dormant state. Even if the branch is severely desiccated, just cut the stem, stick it in water, and cover with plastic to increase humidity. If it revives, it might root. For containers, I use plastic pots or cut-off gallon milk jugs with slits in the bottom for eventual drainage. The key is to find a pot size that will fit inside a clear plastic bag. I fill the containers with my standard mix: 1/2 Peat, 1/4 Sand, 1/4 Perlite. The medium should be moist but not wet since excess moisture encourages rot. 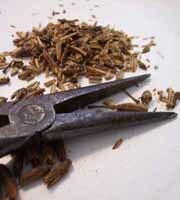 Since rhododendrons and azaleas are shallow rooted, I make short cuttings about1 to 2 inches long. I also remove any flower buds since attempting to bloom will use up energy. To discourage fungus and insect pests, I "sterilize" the cuttings by soaking them for 5 minutes in a solution made of 1 part Clorox and 10 parts water. 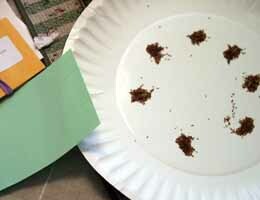 Afterwards, I rinse the cuttings well to remove the Clorox water and allow them to dry in the air for a few minutes. Next, I dip the end of each cutting in a rooting hormone such as Dip 'N Grow, and insert the bottom inch into the potting medium. 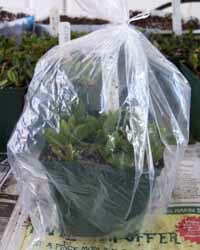 When the container is filled with cuttings, I enclose the pot in a plastic bag to make a mini-greenhouse. Finally, I place the pots of cuttings under fluorescent lights with 16 to 24 hours of light each day. You can set pots on a north window sill with good light, but avoid excessive sun as bags can overheat. 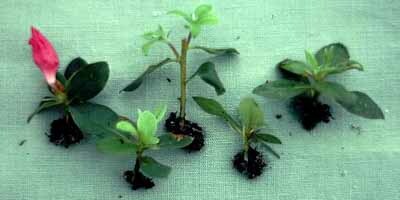 Cuttings should break dormancy in 4 to 8 weeks and at that time they are usually forming new roots. 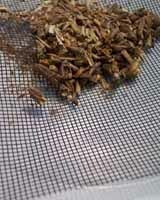 I watch the bags carefully to remove any cuttings that die or leaves that turn brown to keep fungal diseases at bay. There should be no need to water the pots during that time since the condensation on the bag continues to recycle moisture inside the tiny ecosystem. I keep containers under lights during the rest of the winter and early spring. In late spring, after opening the bags to allow cuttings to get accustomed to lower humidity for several days, I try to repot them into individual pots. By early summer, I have moved the cuttings into 3-inch or 4-inch pots and have given a few doses of week fertilizer. By mid summer, plants get no more fertilizer as I want them to harden off before frost. Cold frame protection that first winter is helpful, but dormant cuttings are often large enough by fall to make it on their own. 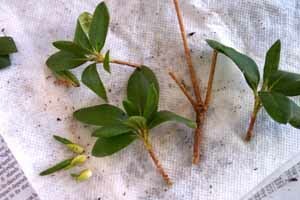 Encouraged by Mike Creel of South Carolina, I will try to root some dormant deciduous azalea cuttings this year. One of the neighborhood bucks used my late blooming R. prunifolium to help rub the velvet off his antlers this fall, so a main branch was severely damaged and will surely die. I plan to try the dormant cutting technique on that rather than letting the plant material go to waste. If you intended to root something last summer but forgot, why not give some dormant cuttings a try? An abbreviated version of an original article by Donald H. Voss was printed in our chapter newsletter. It was originally published in The Azalean, (Vol. 24, No. 2, Summer 2002), and was reprinted with the permission from both parties. �Robin Hill Congo� �Robin Hill Congo� is a wonderful plant, not only for its vivid reddish Purple flowers (a beautiful complement for R. yedoense var. poukhanense) but also for its foliage. �Betty Layman� �Betty Layman� has handsome 3-1/2� flowers that are deep Pink (close to deep yellowish Pink) on a medium-sized, mounding plant. �Corry� �Corry� may not be available widely but its 3� deep purplish Pink, relatively flat-faced flowers make it a desirable specimen plant. �Nancy of Robinhill� �Nancy of Robinhill� (the favorite of Robert D. Gartrell (RDG), who named it for his beloved wife) presents 3-1/2� light to moderate Pink double flowers with broad, overlapping, rounded petals.�Robert�s ideal flower form. �Papineau� �Papineau� is a strongly growing, somewhat upright cultivar with White flowers and leaves that are among the largest in the evergreen azaleas. This plant is a handsome accent in the garden, but it needs more space than many. �Pucken� �Pucken� displays striking vivid purplish Red, frilled, hose-in-hose flowers�often with additional doubling�on a medium-size plant. For a more upright plant with irregularly double flowers much closer to Purple, �Sherbrooke� should be considered. �Betty Anne Voss� �Betty Anne Voss�, named for RDG�s younger daughter, has 3-1/4�, irregularly double, strong purplish Pink flowers on a compact plant. When opening, the buds resemble rose buds. The quality of the foliage surpasses that of most plants in the Robin Hill series�including �Nancy of Robinhill�. A top selection! �Lady Louise� �Lady Louise� was a parent in many later Robin Hill crosses. Its 3� double flowers are deep Pink, suitable for locations where purplish colors are undesirable. Plant is compact and well branched. �Sara Holden� �Sara Holden� is low and spreading. Its flowers are White or variably marked with flecks, stripes, sectors�or even self colored. The markings are deep Pink (close to yellowish Pink). �Watchet� �Watchet� is a favorite of many. The 3-1/2� widely funnel-shaped flowers are a strong Pink with lighter greenish white in the throat. The plant is compact. �Gwenda� �Gwenda� has 3� moderate Pink flowers that are openly funnel shaped with wavy lobes. The compact plant grows and flowers in shade. �Redmond� �Redmond� has 3� widely funnel-shaped flowers on a low, spreading plant. The flowers are deep Pink (close to yellowish Pink), In the Pacific Northwest, it has been used in hanging baskets. �Sir Robert� �Sir Robert� was named for a character in an Angela Thirkell novel. It displays 3-1/2� openly funnel-shaped flowers with broad, rounded lobes on a moderately low, well-branched plant. After cold winters, the coloration has been pale; after warmer winters, moderate Pink to light purplish Pink with varied patterning. �White Moon� �White Moon� has 3-1/2� broadly funnel-shaped flowers with overlapping lobes, giving a very round, flat-faced appearance. Occasional color patterning may involve striping, sectoring, or selfing of deep yellowish Pink to moderate Red. The plant is low to medium in height. In our 2004 Chapter Seed Exchange, we had 129 different varieties and every clone was requested at least once. 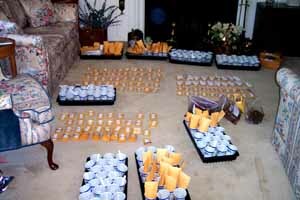 We mailed 600 packages of seed out to more than 30 people. The most popular seed (22 requests) was for a native azalea collected in the wild called we call R. calendulaceum 'Molten Lava'. I thought some would be interested in how the process works. Every fall I search for seed donations. Some people provide cleaned seed but I will take seed pods from almost anywhere. Next the seed is removed from the capsules. Sometimes it comes out easily but often the pods have to be crushed with pliers and the seed sifted through screens to eliminate the chaff. After collecting all orders, I determine how many requests there are for each variety, and divide the seed into an equal number of piles so every person will get some and put each portion in a labeled envelope. To the left is a picture of my living room floor as I am getting ready to fill the orders. It is yet another reason why I don't vacuum! If my computer records were accurate and everything goes as planned, when I fill the last order I pick up the last packages of seed off of the floor. This year went very well. Our Chapter Treasurer, Phyllis Rittman, has prepared a new chapter directory which we are sending you along with our newsletter. What a professional job! Thanks, Phyllis! In early January we signed a contract with the DoubleTree Hotel in Rockville, MD. It will be the site the Joint ARS/ASA Convention in 2006. By shifting the convention dates from the typical Thursday-Sunday routine to a Friday through Monday format, we were able to secure a $99 per night room rate instead of $139. We will need the help of many people to put on this convention, so please offer to assist us!